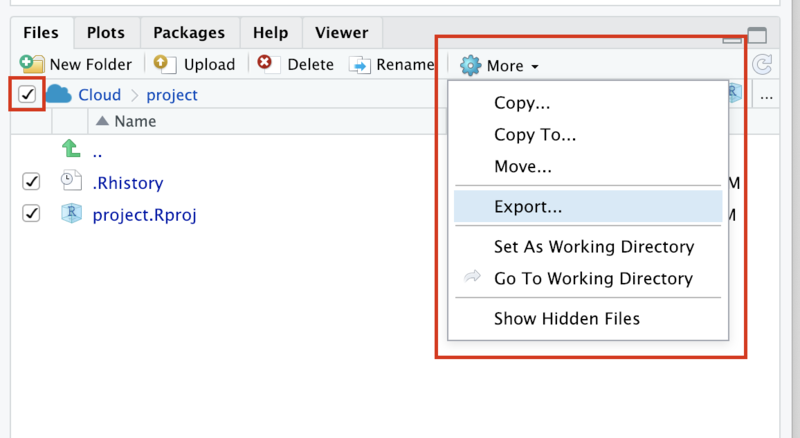 If there's no way to rescue the project in rstudio cloud, is it possible to download the files that were saved in the project directory so I can run them locally? I have the same issue. All files related to my thesis are on the cloud and I have to submit my thesis very soon I can open new project but can't open the old one. So I've booted the project and removed some of the IDE's meta data and your .Rdata file (which was quite large). Both of these things can interfere with project loading. From the IDE's interface you are able to download the contents of your project. In the file pane you would first select the check boxes for the files that you want to download and then click the More --> Export. Would you please do the same for my project too? I can't do anything. It has stuck in "opening" phase. Give the project another try. Thank you seans, but it still does not seem to want to load. It has been "Opening" for 20 minutes now. Is there something else we can try, or is it possible to download the files without loading the project? That's unfortunate. From the internal state it looks like it crashed shortly after starting. Much more rarely there's a second folder of IDE meta data that might be causing the issue - so I tried to remove that as well. Sorry to be a pain but could you give it another try? If it doesn't load could you look at the console log - and network traffic and see if there are any errors. Posting a screenshot could be helpful. Dingo! Managed to get in and save a copy of everything locally. Thanks for all your help! I am teaching a class of 70 with R studio, and often students have this problem. No amount of "restarting the project" works. Where can I find this console log/network traffic log you reference?